Did you know that certain personality types experience bullying more frequently than others? Discrimination based on someone’s type is often insidious and confusing. We may not even be aware that we are bullying someone based on their type till we know more about type and how it plays out; particularly in childhood. 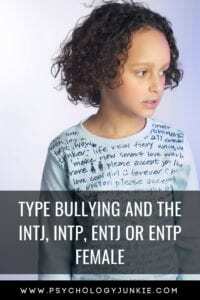 One group of people that know a lot about type-based bullying are the INTJ, INTP, ENTJ & ENTP females. They make up only 6.1% of the female population in our country and tend to grow up feeling like the definitive “square pegs in round holes”. The majority of females in the U.S. are Sensing Feeling (SF) types. They make up approximately 56% of the population. After that, Sensing Thinking (ST) females make up the next highest group, at 19.8% of the population. Intuitive Feeling (NF) females come in third at 18% of the female population. This means that at 6.1% of the population, Intuitive Thinking (NT) females are an extreme minority. In a group of 10 females, you’d be lucky to find even one NT! How Does This Play Out in Childhood? Our culture has generated an “ideal” version of femininity since nearly the beginning of time. Women are expected to be nurturing, sensitive, naturally empathetic, and home-oriented. Is there anything wrong with these qualities? Absolutely not! But is there anything wrong with an independent, intellectual, forward-thinking female? No. Intuitive Thinking females often grow up in environments where they are coerced, pushed, or downright shoved into a role that is more natural to a Sensing Feeling female. “I was raised in an ultra-conservative and traditional family where women were supposed to be the nurturers and empaths. Not only were those seen as feminine traits but it was assumed that a girl would have and be drawn to only certain things because of her sensitive and emotional nature. This never felt like it fit me and made me feel something was wrong with me. Women leadership (and in my culture – education) was not encouraged or seen as necessary or appropriate. Women’s roles in my culture were VERY specific and limited. I tried so hard to force myself into roles that didn’t fit. This was especially true being raised in a religion that taught that certain traits like empathy and nurturing were established in ALL women and part of their specific role. INTJs are likely to challenge religious constructs anyway. Faith is possible for the INTJ girl – but mindless obedience is not. Rebecca’s story is one that many NT females will identify with. Intuitive Thinking characteristics are much more accepted in the male community, where being direct, bold, straightforward, and skeptical are considered more natural and true to their gender. Because Sensing Feeling types make up such a large majority of the female population, they have become the expected “norm” and anything outside of that is seen as not “quite right”. Sensing Feeling females will have a natural desire for harmony in their outer world; they are usually tactful, and they tend to have a natural desire to please their parents and make others happy. They are also more typically drawn to “feminine” activities; playing with dolls, playing house, dressing up as princesses, cooking, etc,..
Sensing Feeling females tend to have an innate respect for authority during childhood; and will often excel at traditional gender roles like nurturing, homemaking, and taking care of young children. Don’t get me wrong, there are variations within any temperament group, but statistically speaking, these are traits that the majority of Sensing Feeling females will excel at. 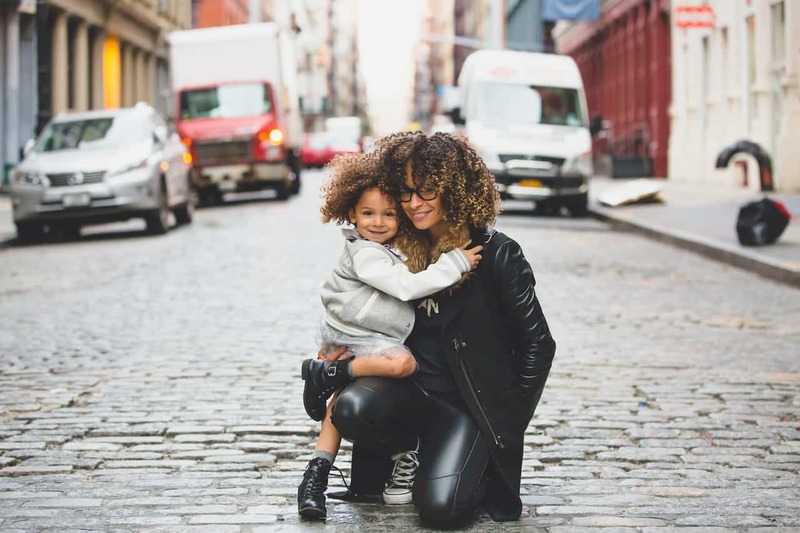 Intuitive Thinking females have a completely different set of strengths that can go unnoticed if a parent, teacher, or friend is too focused on what makes them different from the norm. NT girls are astoundingly logical, confident in their assertions, independent, and incredibly innovative thinkers. But too often they grow up hearing how they’re different from other girls their age. The repercussions of this are saddening. Intuitive Thinking personality types are intellectual, logical, and constantly seeking new knowledge. They are pragmatic and excellent at problem-solving and finding innovative solutions. They are drawn to the abstract and theoretical, and try to uncover hidden truths behind every subject and topic. They are naturally hesitant to accept traditional rules, and they are skeptical of every statement until it has been held up to intense scrutiny. NTs are quick to see flaws and errors in logic that other types may gloss over or ignore. They are always looking to understand the core truth of every subject, and as a result, make excellent debaters. They are analytical, curious, strategic, independent, and complex. Can NT females be nurturing, caring, and empathetic? By all means, yes. Every personality type is going to use feeling AND thinking; but NTs are going to consider the logical approach first. When someone comes to them with a problem, they will try to step out of the situation to give an objective viewpoint. Feelers tend to “step in” to the problem to see how the situation may affect everyone involved and how people might feel. By comparison, the NTs approach may seem cold or too impersonal; particularly to feeling dominant personalities. However, their goal to help is just as noble and sincere as the feelers attempt to help. I’m a firm believer that no one personality type is better than another. Intuitive Thinkers are essential in our world; without them, we wouldn’t have Marie Curie, Isaac Newton, or even Jane Austen! We also need the Sensing Feeling types, with their practical, caring nature. However, when one type is considered the ideal and the other type is considered an aberration it leads to all kinds of emotional damage in the long run. Intuitive Thinkers are not naturally in tune with the emotions of people around them; they are more in tune with logic, systems, and organizations and how things work. When there is a pre-conceived idea that as a female you will naturally be empathetic or emotionally sensitive and you don’t display those traits, parents and friends can think you are cold or unfeeling. The most important thing you can do for your NT daughter is to show her that you appreciate her for who she is. Don’t try to force her into a Sensing/Feeling mold or berate her natural curiosity and directness. Praise her for her logic, her inquisitiveness, her ability to see beyond face value, and her independence. Give your NT daughter healthy opportunities to debate and “argue” effectively. This doesn’t mean you should allow talking back and incessant arguing. It means setting up one-on-one meetings where she can discuss her concerns and questions. It could also mean signing her up for debate club, or having a family debate club where she can practice arguing her case. Model empathy and compassion. Try to understand where your NT daughter is coming from and that sometimes when she is being very direct she may not understand that it can seem tactless. NT girls care very much about people, but they aren’t naturally in tune with emotions. You can help your NT daughter by re-phrasing comments back to her so that she can more easily navigate social situations. Let her know you appreciate her honesty and straightforward behavior. Do you have any suggestions for NT girls or parents of NT girls? Let me know in the comments! I’d love to hear from you! 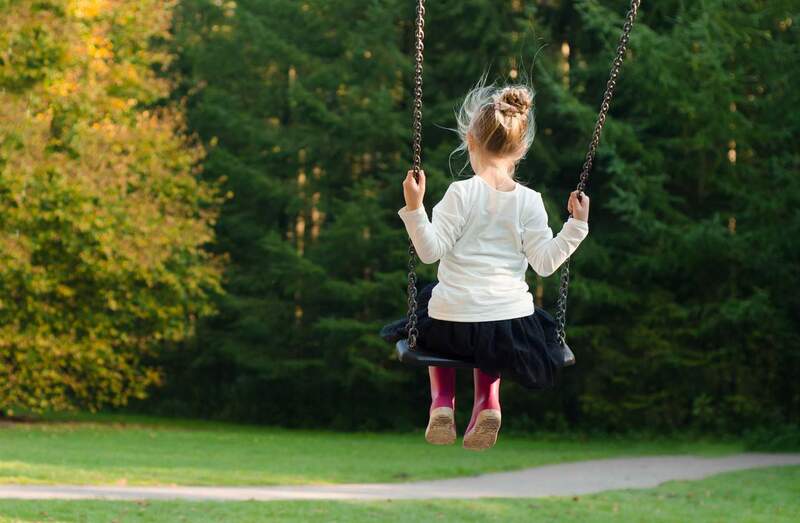 Can Childhood Trauma Impact Your Personality Type? Subscribe to our newsletter and get an eBook packed with powerful parenting tips for each personality type! Enjoy 28 beautifully illustrated pages exploring the needs and strengths of all 16 personality types in childhood. Thank you for joining our newsletter! Check your email for your free ebook! As a child, I was often told by my prima donna mother (literally a Juilliard-trained coloratura soprano) that I was cold and uncaring. I just don’t wear my emotions on my sleeve, and when I am around others who are hysterical flibbertijibbets — ironically, a word my mother used to use — I can feel my face becoming mask-like. I was like that even as a child. My mother used to try and actually goad me into emotion and compounded punishments when I wouldn’t get upset or rattled. My older sister was on board with her, and there were times my sister’s friends would make fun of me and punch me up as she held my books. Childhood pretty much sucked. And for some reason I could rarely come to my own defense. I would be inwardly outraged at the bullying of others, but I couldn’t speak up for myself. I never told anyone because my sister was the outgoing flower who could do no wrong. I would say the best gift a parent could give any child, but especially an introvert and the INTJ, is the gift of time and listening without judgments. INTJ’s prefer to work things through and solve their own problems. Get the INTJ child to go outside and do something. They need physical activity or they get stuck in their own head. Of course, they should read, but that shouldn’t be their only hobby! Show them lots of love. They may not be very demonstrative, but INTJ kids crave love the same as other kids. They may want a chat, some quiet company, and a pat on the shoulder for a job well done, but they also definitely need to know you love them. Don’t be offended when they don’t jump all over you with hugs and kisses. I’m not saying it can’t happen, but it isn’t the hallmark of an INTJ kid. My mom (I didn’t realize I had so many mother issues until writing this!) would give me an annual hug at Christmas whether she thought I wanted it or not. Oh, and A LOT of INTJ’s grow up to feel like they have the BEST Myers-Briggs personality that exists and that’s crap. There is so much typing with INTJ’s and the Mastermind, Gandalf, Moriarity, blah, blah, that feeds into the over-inflated sense of self that the INTJ is already stuck on in their own head — I myself get annoyed reading posts by self-indulgent INTJ’s who are just in love with themselves and their personality. Kindly and patiently teach them to respect and be kind to others. Negotiate with them on which type of charitable acts to choose to learn compassion for the less fortunate, too. Along this tack, the INTJ’s greatest strength can be their greatest weakness: Thinking is not all a human is made of. Feelings are so important. I know they are. They must be. : ) There have been times when it has taken me years to process and deal with grief because I just never learned how to and thinking a l w a y s has trumped feeling for me. I don’t have any clues on how to remedy this because I have never healed myself. Best of luck gathering your data! It sounds like a fun learning adventure!! So true. My biological mom and favorite aunt always worried that there was something wrong with me because I didn’t express my emotions enough. My foster mom was always mad at me for “talking back” when I was only stating my opinion or asking a question. Ugh. I am an INFJ. My youngest is an ENTJ. In some ways, we get along so well, but I have to admit she drives me nuts sometimes. (I am sure I drive her nuts, too.) Nine times out of ten, it isn’t that I don’t appreciate that she is THINKING of these things to argue with me about, but it’s just that I don’t have the energy to have the conversation. I just want to hang out in silence with her and disappear into my thoughts. These tips are helpful because I sometimes struggle with expressing this to her in an age appropriate way and verbally. If only everyone communicared through written word, I could eloquently explain! I do not want to downplay those few nt females But not all who seem to be nts are like . Before recently I have taken the official test and came out entp , but it was not true my true type was clouded by mental Inness . After getting the proper help and improving . And just being tested again to be sure , because their was a major shift in my thinking. I am a true enfp. I mean with this not everyone how how appears nt is. I am an SJ with a NT daughter. I am working hard to give her the room she needs to be who she is, but it is really taxing sometimes. 🙂 I appreciated the tips here and especially the suggestions in the article about giving her room to learn as much as possible. She is so interested in the how and why of things! Here’s my tip to help those with NT children who like to debate: We play a game called “real or not real.” We debate things like unicorns, lochness monster, bigfoot, and UFOs. We play this game anywhere, especially on vacation over lunch, and we each present “evidence” for our opinion. Is it real or not real?